JkDefrag is a free defragmentation program for all Windows systems starting from Windows 2000*1. JkDefragGUI is the graphical user interface for comfortable handling for this program. JkDefrag (GNU licence*2) defragments very fast, has several optimisation strategies, offers highest possible data security and can also defragment external storage media. However options can only be entered over the Windows command. Graphical user interface for starting JkDefrag without having to know the command line instructions. German version of the program JkDefrag with source code. Installation version of the program JkDefrag with screen saver and GUI. Many thanks to the translators. At the standard JkDefragGUI package are 10 languages included. For additional languages download this package, it contains 40 languages. At the graphical user interface JkDefragGUI is the "intern" file JkDefrag in english. To change the language simply download the desired language version and replace the file JkDefrag.exe in the folder „programs“ with the downloaded. If the downloaded file has another name rename it to JkDefrag.exe. Naturally the language versions can be used also independently. New: Detecting of all mapped network drives and mounted USB drives. Included is a DLL library (for Microsoft Visual C++ 2008; released under the GNU Lesser General Public License) containing all the defragger subroutines, which you can call from just about any programming language (for example Delphi and Visual Basic). Dependent on the version of your compiler you could need the platform SDK von Microsoft around these to compile. Specially designed to be run automatically in the background, or from administrator scripts. See also in the Handling chapter for the command line options. Specially designed to set up the screensaver. In addition the file JkDefragScreenSaver.scr have to be in the "System32-folder" (usually "c:\Windows\System32\" or "c:\Winnt\System32\"). For starting JkDefrag without knowing the command line instructions and with additional functions. 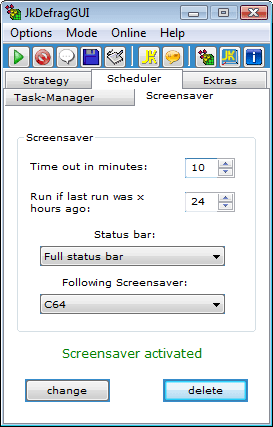 Also for simple configuring the task manager and the screensaver. Contains also the first two and the following files. It's no installation necessary. If the file is in the "System32-folder" it will automatically become visible in the list of screensavers as "JkDefragScreenSaver" and can be used just like any other screensaver. In this file are stored the completed tasks and analyses of the drive(s). JkDefragScreenSaver.log and JkDefragTaskManager.log are produced by the appropriate applications. JkDefrag is based on the standard Defragmentation Interface by Microsoft (the FSCTL_GET_VOLUME_BITMAP, FSCTL_GET_RETRIEVAL_POINTERS, and FSCTL_MOVE_FILE function calls), just like all other defragmenter. It is therefore very solid, there is no risk of losing data or the disk getting scrambled, and you can run it while the computer is in full use. JkDefrag has to scan all the files on the disk to determine if they are fragmented and where they are. At the moment it has to use very inefficient Microsoft function calls, in the future I hope to speed this up by directly reading the MFT and FAT. Windows reserves a percentage of the disk for the MFT (Master File Table), but can place normal files there if the rest of the disk is full. The files will remain there, even when there is enough space again. JkDefrag looks for files in the MFT reserved space and moves them to normal disk space, making the reserved space available again for the MFT. On most hard disks the beginning of the hard disk is considerably faster than the end (see therefore in the chapter "Links" the program "DiskSpeed32"). The default JkDefrag optimisation strategy therefore moves all files to the beginning of the volume. It is intended for daily use and will simply fill gaps with files from above, very quick and with very little data movement. Sorting the files on your disk can give you even more speed. There are several sorting strategies to choose from (see the "-a" options). These are all very slow and intended for occasional use only. JkDefrag classifies files into 3 zones: directories (zone 1), regular files (zone 2), and big files (zone 3). Files outside their zone are moved to their zone. Directories are perhaps the most accessed data on disk, so zone 1 is placed at the beginning of the hard disk. 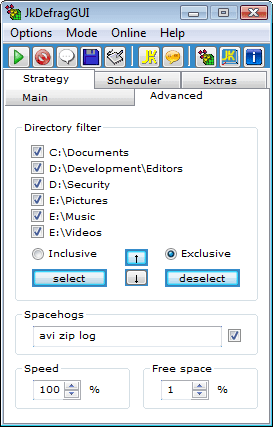 After the directories comes a free area (see next item), then zone 2 with regular files, another free area, and then zone 3 with big files, which are files bigger than 50 megabytes (see also -u mask); files with certain filenames such as archives; files in the recycle bin; service pack files, and other infrequently accessed data. The begin and end of the zones is determined automatically (see also -f option). A running computer will create and delete temporary files like there is no tomorrow. If the hard disk were completely optimised then the only place for new temporary files would be behind all the other data. Which is rather slow. So JkDefrag maintains a free space of 1% of the total disk space between zone 1 (directories) and zone 2 (regular files), and between zone 2 and zone 3 (big files). JkDefrag shows a high-detail map of the hard disk, refreshed 3 times per second. Bottom-left of the window is the beginning of the hard disk. Snapshot of JkDefrag in action. The program is completely automatic, there are no buttons and no pull-down menu's. Default behaviour of JkDefrag is to automatically process all the mounted, writable, fixed volumes on your computer. You can change this behaviour with command line options (applies to JkDefragCmd.exe and JkDefrag.exe) or use JkDefragGUI. Permissions: JkDefrag needs "full control" permissions to all files that it must defragment/optimise. On a default Windows system the "administrator" user ID has full permissions to all files. Users can also run JkDefrag, but then it can only defragment/optimise the files for which the user has "full control". On Windows Vista: right-click the JkDefrag program and select "run as administrator". Stopping: JkDefrag can be stopped safely at any time, there is no risk of losing data or corrupting your disk. This optimisation strategy is very suitable for day-to-day use. It moves a minimum of data on the hard disk and finishes very quickly, but will not fill all the gaps on the disk. The strategy scans for gaps on the disk and fills them with files from above. This optimisation strategy is for incidental use once in a while. It takes a lot of running time and data movement because it tries to fill all the gaps on the disk. The strategy is the same as for fast optimisation, plus the files just above a gap are moved away until the gap can be completely filled with files from above. All the sorting optimizations will create fragments. This is by design, it is not a bug. These sorting optimizations are for incidental use once in a while. They take a lot of running time and data movement because they rewrite all the data on the disk. The strategies vacate a small area on disk and then fill it up again with the files in the selected order. sort by name (action 7): very good for fast program starting. The files used by a particular program will be very close together on disk. sort by size (action 8): placing all the small files together at the begin of the disk will dramatically reduce the average file seek time. sort by last access (action 9): files that have not been accessed in a while are probably unimportant and are best sorted to the back. sort by last change (action 10): placing files together that change a lot (for example databases and log files) will speed up regular operation of the system. sort by creation time (action 11): the oldest files on the disk are likely to be important system files, for example used when Windows is booting. Intended for partition resizing. All movable files are moved to the beginning of the disk, even if it means fragmenting them to fill gaps that cannot be filled otherwise. Move all the files to the end of the disk, making more room at the beginning of the disk. Intended for big and rarely used files such as log files, backup archives, installation files, and such. 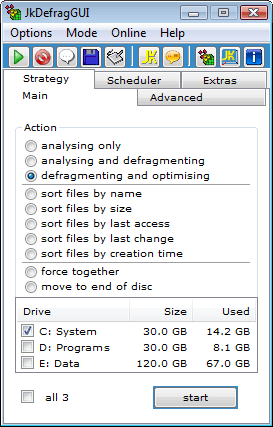 Here you can select a certain drive or a certain partition for analysis / defragmentation / optimisation (actions 1 - 11). In addition, all drives / partitions can be selected at one time. Spacehogs are less important files that take up a lot of space. JkDefrag moves them behind the directories and the regular files, to make those faster. Specifies the percentage size - based on the disk capacity - of the free spaces between the ranges (zone 1 - 3). If you want to defragment at certain intervals by the screen saver you can install and configure JkDefrag as screen saver. 1 = Analyse only, do not defragment and do not optimise. 2 = Analyse and defragment, do not optimise. 3 = Analyse, defragment, and fast optimisation (default). 4 = Analyse, defragment, and full optimisation [since v3.14 removed; for downward compatibility the actions 5 and 6 were not renumbered. If you enter "-a 4" now you will get the same behaviour as "-a 3".]. 5 = Analyse and force together, do not defragment. 6 = Analyzer, defragment, and move to end of disk. -e "mask" Exclude files or directories that match the mask. The files will not be defragged and will not be moved. Use wildcards '*' and '?' in the mask to match a set of files or directories. If the mask contains a space then it must be enclosed in double-quotes. Some examples: "*.avi", "*\w3svc*\*.log", "D:\MySQL\Data". - archives, files in the recycle bin, service pack files, and some others. Disable this list by specifying the special mask "DisableDefaults". Use wildcards '*' and '?' in the mask to match a set of files or directories. If the mask contains a space then it must be enclosed in double-quotes. Some examples: "*.avi", "*\w3svc*\*.log", "D:\MySQL\Data\*". -s N Slow down to N percent (1...100) of normal speed. Default is 100. -f N Set the size of the free space to N percent (0...100) of the size of the volume. The free space is an empty area at the beginning of the volume for temporary files. Default is 1%. 1 = Warning messages [default]. 2 = General progress messages. 3 = Detailed progress messages. 4 = Detailed file information. 5 = Detailed gap-filling messages. 6 = Detailed gap-finding messages. -l "filename" Specify a filename for the log file. Default is "JkDefrag.log" and "JkDefragCmd.log". Specify empty string "" (two double-quotes) to disable the log file. -h Show a short help text (command line version only). Alternatively use: -help or --help or /? . -q Quit the program when it has finished (windows version only). items The items to be defragmented and optimised, such as a file, directory, disk, mount point, or volume, including removable media such as floppies, USB disks, memory sticks, and other volumes that behave like a hard disk. Wildcards '*' and '?' are allowed to select a set of files. If the item contains a space then it must be enclosed in double-quotes. Some examples: "C:", "D:\MySQL\Data", "F:\*.log"
Tip: Cleanup old junk from your hard disk before running JkDefrag. Tip: Stop your real time virus scanner before running JkDefrag. Virus scanners check all disk activity, making defragmentation and optimisation very slow. Tip: If a program (for example a database) prevents certain files from being defragged then stop the program, run JkDefrag for the particular data directory only, and restart the program. JkDefrag is based on the standard defragmentation API by Microsoft, a system library that is included in Windows 2000, 2003, XP, and Vista. All defragmenter are based on this API, including commercial defragmenter. JkDefrag is therefore very solid and there is no risk of losing data. You can stop the program at any time, it will finish the current file in the background. If your disks use NTFS then you're even safe when the computer crashes in the middle of defragging. Nevertheless, it's still a good idea to backup before defragmenting, just like with other defragmenter, because the heavy use of the hard disk may trigger a hardware fault. How do I specify an option, or select a single disk (folder / file)? Note: In the same properties window you can select "minimized". Note: The command line version "JkDefragCmd.exe" will exit automatically when finished. JkDefrag can be stopped safely at any time, there is no risk of losing data or corrupting your disk. You can use all the usual ways to stop a Windows program, such as pressing ALT-F4, clicking the 'x' in the top-right corner, via the pull-down menu in the task bar, or by killing the program via the task manager or another utility. The command line program can be stopped the same way, plus by pressing CTRL-C, or BREAK. How to run JkDefrag automatically? The wizard starts, click 'Next'. Use the 'browse' button to select the 'JkDefragCmd.exe' program. Select 'daily', next, select a time, next. 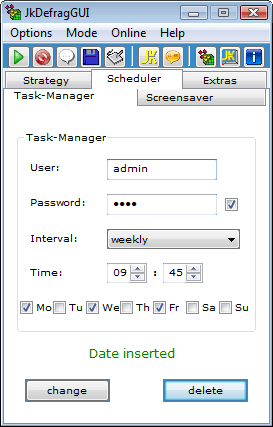 Enter a user ID / password with administrator privileges, click 'Finish'. How do I use the screensaver? See the instructions in the files chapter. How to run JkDefrag at boot-time? Note: This will not defragment system files such as the page file. To do that see the links chapter for the link to Pagedefrag, a free utility by Microsoft Technet (formerly SysInternals). How to start minimized, or maximized? Make a shortcut to the "JkDefrag.exe" program, open the properties of the shortcut, find the "run" setting, and select "minimized" or "maximized". A typical hard disk can easily contain tens of thousands of files, all with different sizes. What is the optimum way to organize the files into the blocks? The number of permutations is astronomical, it boggles the mind. JkDefrag doesn't even try to calculate them all. It concerns itself with only one block at a time, trying to fit only files from above the block, and limits itself to 0.5 seconds of calculating time. So it's very unlikely, if not impossible, for JkDefrag to perfectly optimise your disk, more's the pity. Files can only be fully defragged if there is a gap large enough to hold the entire file. If no such gap is available then JkDefrag will try to reduce the number of fragments by moving the file to the largest gaps available. JkDefrag maintains a "free space" area just above the directories at the beginning of the hard disk. This is by design. See the "-f" command line option to control the size of this free space. Can I run JkDefrag outside Windows? JkDefrag is based on the Windows defragmentation library, so Windows must be started. JkDefrag can be run from a bootable Windows CD-ROM (such as BartPE, see http://www.bootcd.us/), but cannot be run from a DOS bootable floppy. For questions about how to use JkDefrag. Questions about the programming library, and sharing example code. JkDefrag and JkDefragGUI are 100% free of viruses or other malware, nevertheless an anti-virus program can announce in rare cases falsely an alleged virus. The task manager at JkDefragGUI doesn't work without password / codeword of the current Windows user (Version 1.5 and lower). JkDefrag makes a special exception for files used by SafeBoot, Acronis OS Selector, SecurStar DriveCrypt, and Symantec GoBack. The files will never be moved. The Windows defragmentation API refuses to move directories on FAT32 file systems. This is a known FAT32 limitation and not a bug in JkDefrag. The Windows defragmentation API does not work on Windows 2000 with disks that were formatted with a cluster size greater than 4 kB. This is a known API limitation and not a bug in JkDefrag. Forum for JkDefrag, a place where you can ask questions, give feedback about features you would like, share your experiences, share code that uses the defragger library, and other things about JkDefrag. Small utility that shows which file is using a particular location on the hard disk. Use this if you are wondering which file JkDefrag could not move. The utility takes a while to start up, because it has to analyse all files one by one, but it's a very nice little utility nevertheless. A very nice utility that will run maintenance programs as early as possible in the Windows startup. JkDefrag is one of the supported programs, others are for example Microsoft's Disk Cleanup, ScanDisk/Chkdsk, Norton's Disk Doctor, and others. LibertyKey is a program collection of selected free software and useful tools for local or portable (e.g. USB memory stick) use. JkDefragGUI is one of the integrated programs. If you have questions etc. you can send me a mail to Markus@Hörl.org or 1@kandro.de. jkdefrag.8qm.de is a private project. The software on 8qm.de is Freeware. That means, that it is passed on free of charge.